This app is designed for use by people already familiar with the ketogenic diet and lifestyle. It complements other nutrition or fitness apps – it is not a general nutrition app but only includes a calculator which gives the ketogenic ratio of meals when one enters the grams of macronutrients (carbs, protein and fats). Thus when planning meals with KetoCalc, one first needs to determine the total number of macronutrients with another general nutrition/fitness app (such as with the free app "LoseIt!"). One can easily go back and forth between such an app and ours to see the ketogenic ratio of meal plans. Urine ketosticks are known to yield notoriously inaccurate results, while blood tests can be painful and expensive, breath ketone analyzers can be even more expensive. All of these tools only let you see if your food was ketogenic AFTER your meals, while KetoCalc lets you PRE-PLAN ketogenic meals per meal or on a daily basis. Playing with KetoCalc a few times according to our simple instructions is the best way to learn what a real ketogenic meal looks like – at a one time cost less than that of a box of ketostix. OTHER KETOGENIC RATIO CALCULATORS USE A FLAWED FORMULA which adds protein and carbs together in a ratio against fat, but carbs and protein do not contribute equally to the degree of anti-ketosis. This popular simplified formula can result in underestimating the amount of protein needed to maintain muscle mass for a given ketogenic ratio, but KetoCalc uses a well-tested and well documented formula developed by award winning researcher Rollin T. Woodyatt M.D. 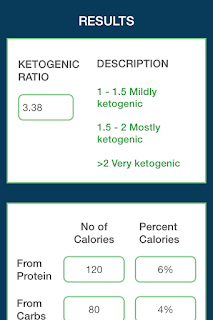 We have confirmed the accuracy of his formula with spreadsheets, and blogs contain ketogenic diet success stories using the KETOCALC app affirming the accuracy of the ketogenic ratio that the app yields. MAINTAIN KETOSIS WITHOUT EXCEEDING THE CALORIE LEVEL OPTIMAL FOR YOUR WEIGHT LOSS GOAL – Not everyone knows that too many calories (even from low-carb sources) can stall weight loss or may cause weight gain in ketogenic diets. 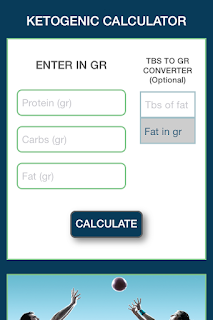 Our simple calculator lets one easily adjust the macronutrient amounts to plan ketogenic meals without exceeding one's desired calorie level. 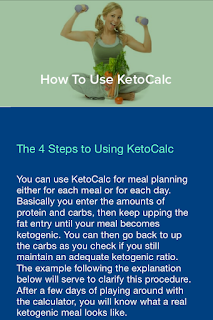 DO NOT LET THE SIMPLICITY OF THIS APP FOOL YOU – See our clear 4-step process now to learn all you need to know to accurately pre-plan ketogenic meals. These simple instructions eliminate the room for failure by not only ensuring ketosis but also ensuring that one avoids the three pitfalls of weight loss listed below on a ketogenic diet (in the case weight loss is desired and not only ketosis for its therapeutic benefits). REMAIN IN KETOSIS EVEN IF YOU SLIP AND GET BACK ON TRACK FASTER Few people know that even if one eats too many carbohydrates at a meal, it is still possible to maintain ketosis by eating a larger amount of fat. This is definitely not recommended, as the excessive number of calories can prevent weight loss or lead to weight gain in the long run. But in the case that one may "accidentally" slip just one time (for example, by "accidentally" wolfing down that pie slice), KetoCalc can let one calculate how much fat to eat to retain the health benefits of not going out of ketosis. By eating more fat and remaining in ketosis, one can also start losing weight again sooner as one maintains the body’s fat burning adaptation. Otherwise, even going out of ketosis occasionally, according to researcher Dr. Stephen Phinney, requires another three week adaptation period. 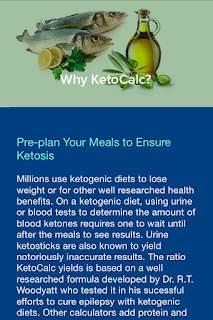 Since Ketocalc yields the total number of calories in addition to yielding a ketogenic ratio, this lets one adjust the amount of macronutrients in a meal plan to both maintain ketosis and a desired calorie level optimal for weight loss or for maintaining one's ideal weight. The app works offline and fast without advertisements. Feel free to email KetoCalc@gmail.com if you have questions. We will respond promptly. Copyright John L. Theobald. All Rights Reserved. Powered by Blogger.